Thank you for being here today to celebrate the life of Sister Jeanette. Our monastic community certainly extends our sympathy to Sister Jeanette’s relatives, Carol and Lisa, and Sister Jeanette’s friends and acquaintances from St. Mary’s Parish, the Bismarck-Mandan Symphony, and former students. Sister Jeanette did see her life and those she loved as gracious gift. Throughout her life, music was the common thread running through it. Sister Jeanette started playing the piano and the violin while in the third grade and added the organ in the eighth grade. She received a bachelor’s and a master’s degree in music and taught elementary school music for 37 years. In her file, I found a “ministry assignments survey” that Sister Jeanette filled out for the prioress in 1968, so about midway through her teaching career. I’d like to share a quote from that survey where she describes her work. I never witnessed Sister Jeanette teaching a classroom of children, but her answers to many of the questions on these surveys indicated that she certainly enjoyed it. Many of the other papers in her file were requests to the monastery’s education committee to attend music workshops, particularly in the Orff method of teaching music. I became more acquainted with Sister Jeanette when she moved to the monastery. During her years residing at the monastery and my years teaching at the university, most of my interactions with Sr. Jeanette were while I was going or coming. In the mornings, she was finishing her breakfast while I left the dining room for school and she always wished me a good day. Many days when I was coming home from school, she would be seated on the bench by the upper parking lot, a bench we will walk by on our way to the cemetery in a little bit. She loved to sit in the sun and soak up the warmth. 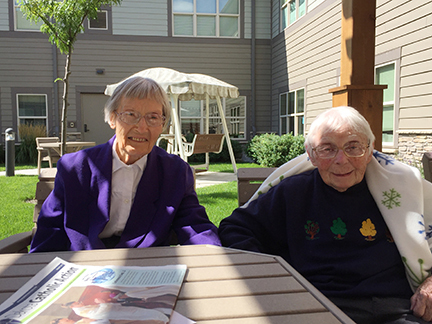 Sister Jeanette had a difficult summer, starting with the fall she had in June. Throughout the summer, I visited her regularly, whether at St. Alexius or the Baptist Health Care Center, and enjoyed visiting with her. She was still so aware of what was going on and loved to hear news from the monastery. Sister Jeanette had that sparkle in her eye and the cute little grin when we visited. She worked diligently at her rehab with the hope of coming back to the monastery. I will always treasure taking Sister Elizabeth up to the Baptist Home to see Sr. Jeanette the week before she was admitted to the hospital with pneumonia. We sat out on the patio and enjoyed root beer floats. Jeanette’s was more of a root beer soup by the time she got around to eating it, but she enjoyed it all. Going back to the song lyrics: “When music wakes my sleeping heart and plays my spirit strong, then all I love is gracious gift and every breath a song.” Sister Jeanette’s life was gift and song to all of us. Sister Jeanette, thank you for your example, your 69 years of monastic life dedicated to God, for the ways you inspired others to be patient, pleasant, and kind. We are grateful for the gift you have been to us. May you now share in the glory of God with the saints in heaven.